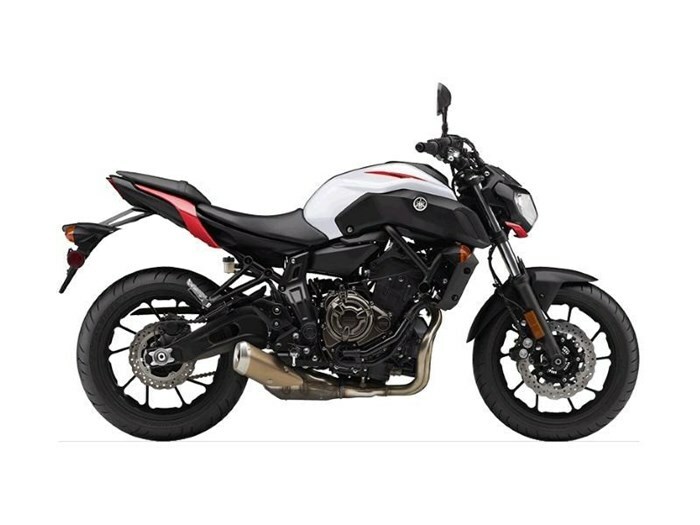 2018 Yamaha MT-07-CONQUER ROAD.The MT-07 is a motorcycle that offers big time fun, affordability and riding enjoyment. This versatile naked roadster offers deep engine torque from its 689 cc parallel twin and a comfortable upright riding position combined with a lightweight, easy-to-handle sport chassis. For 2018 the engineers have upgraded the suspension and redesigned the headlight, taillight and bodywork. 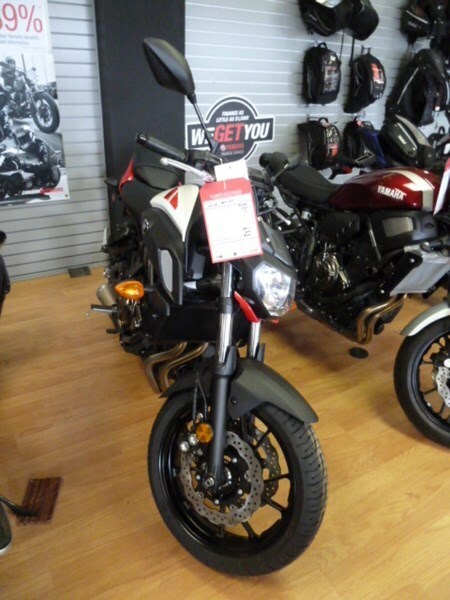 The revised MT-07 is the perfect machine for both new and experienced riders alike who are looking for outstanding value in a mid-class sport bike. STYLING For 2018, the MT-07 has been restyled to more closely resemble its bigger MT siblings. Revised aesthetic items include the headlight, front fender, air scoops,, taillight, tail section and new colour options. ENGINE The ultra-reliable, liquid-cooled, 689cc, inline twin has been designed to provide deep torque in the most frequently used rpm range (3,000 to 6,500 rpm). A single balancer shaft keeps things silky smooth, while the 6-speed transmission with overdrive 6th gear reduces engine rpms at highway speeds. BRAKES ABS equipped dual 282 mm discs with 4 piston calipers up front and a 245 mm rear disc with single piston caliper provides piece of mind while braking under pressure or in wet conditions. Features may include: ENGINE Slim, compact, 689cc, DOHC, 4-valve, liquid-cooled, 20 degree inclined, inline twin cylinder engine. The engine has been tuned to provide plenty of low & mid-range torque with very linear throttle response. This engine is not about big specification numbers; it produces approximately 75 hp. & 50 ft. lbs. of torque and is designed to maximize riding fun in the "real world". 4-valve, downdraft style combustion chamber with 11.5:1 compression ratio. 42,000 kms. valve adjustment intervals. Lightweight hollow camshafts. "CrossPlane Concept" 270 degree crankshaft with an "uneven" firing order. CP Concept offers "ride ability that allows the rider to control the machine at will." Lightweight gear driven "coupling force balancer" reduces engine vibration for excellent comfort. CHASSIS Diamond-type, high tensile steel frame. 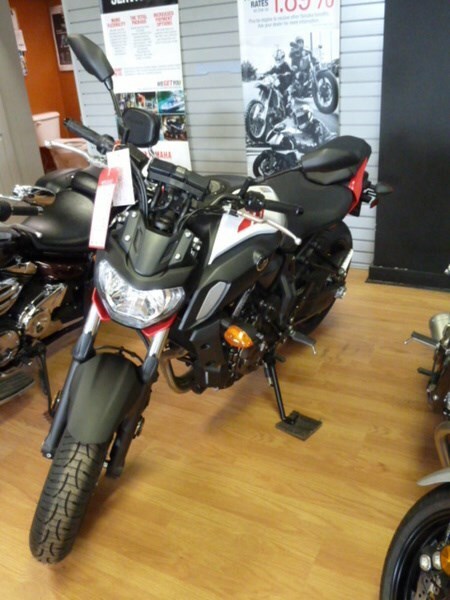 Upright, comfortable riding position is a key feature of the MT-07. Lightweight, high tensile steel "gull wing" type short design swingarm. Revised, 41mm conventional fork offers 130mm (5.1") of wheel travel. Lightweight, aluminum upper & lower triple clamps. Revised, adjustable link-type Monocross rear suspension with 130 mm (5.1") of wheel travel. ABS equipped dual 282mm floating wave-style front discs & ultra-rigid 4-piston monoblock calipers. ABS equipped 245mm wave-style rear disc is squeezed by a lightweight single piston slide-type Nissin caliper. Anti-lock braking system (ABS). Lightweight, cast-aluminum 10-spoke wheels.